What is it? 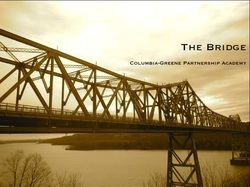 The Columbia-Greene Partnership Academy (C-GPA) also known as "The Bridge" is a New York State approved Alternative Transition Program for 16-year old students from the Catskill and Hudson School Districts who are at risk of dropping out of school due to a lack of credits accrued toward graduation. Additionally, the school will serve special education students from the surrounding area. Vision: The vision of the The Bridge is to foster self-confidence and success in an educational environment which emphasizes the importance of all people in all cultures. This environment will also reinforce positive behaviors which will be continuously emphasized by all staff in a respectful manner, allowing students to develop a more positive approach to their educational and personal lives. Goal: The goal of The Bridge is to establish a positive academic and behavioral attitude within each student to best prepare them for successful entry into a Questar Career and Technical Education (CTE) program or re-entry into the traditional educational environment of their home district on track for graduation. • Implement a workforce readiness curriculum along with the opportunity to gain entry-level employment by reinforcing skills. Academic Classrooms: The Bridge operates as a nucleus family model with all members contributing to the greater good of all. Students will learn in a small class size setting. All teachers are dual-certified in a specific content area as well as in special education. Students do not need to be classified as special education, however, the concentrated training each teacher has will enable them to meet the unique needs of students who have not met success in the traditional school setting. Students will switch classes but benefit from faculty members who have the education, experience and success serving the non-traditional student. Social/Emotional Learning and Skill Building: Each student will receive self-regulating, conflict management and tolerance skills embedded in the curriculum to help manage emotions. Cutting-Edge Technology: Students will have experience with SMART board technology, iPads and laptop carts that will provide students with 21st century technology skills to prepare them for future careers. Tutoring: All students will have additional tutoring opportunities for every content area to help them understand concepts and keep them from falling behind in their work. Credit Recovery: Students can work at their own pace and make up credits in a variety of subject areas. Students are provided these opportunities after the school day to maximize learning. The ability to recover credits is a key to getting on track for graduation. Academic Labs: Additional support for students is offered in both English and math. Students work on skill areas that need improvement as well as areas where they need to be challenged. Workforce Development: All students will take a credit-bearing course designed to build problem solving, communication, teamwork, leadership, creativity, work ethics and social responsibility skills. These skills will connect school to work. Sports/After School Activities: Students may participate in all sports and after school activities in their home school district. The Bridge focuses on learning, collaboration, and results because … FAILURE IS NOT AN OPTION AND SUCCESS IS OUR AIM.